Zero LHPSWC 185's, about 0.035 shoulder exposed above the case, crimped to 0.469, OAL at 1.220. I had a couple rounds fail to chamber, with the nose catching hard on the bottom of the barrel ramp, to the point that they wouldn't chamber even when I tried to rerack. Had to lock the slide back, drop the mag, and drop the round out the bottom. This is a series 70 Gold Cup with a 12# spring and metalform mags with round followers (stock spring). So I've seen suggestions to shorten down to 1.200, so about 0.015 shoulder exposed, or go up to 1.240-1.250 , and expose more shoulder. Thoughts? Should I just try both? It may not be the OAL. It might be your magazines. This bullet feeds with no problems in my Range Officer but not consistently in my Clark Series 70 with a NM barrel. I'm using mags with round followers. I found if I switched to some old GI mags with flat followers, they fed better in the Clark. I've got one mag with a flat follower. I'll give that a shot. Thanks! If that doesn't work, then trying a longer OAL might help. Just take the barrel out and use it to gage how long you can go and have the case chamber properly. 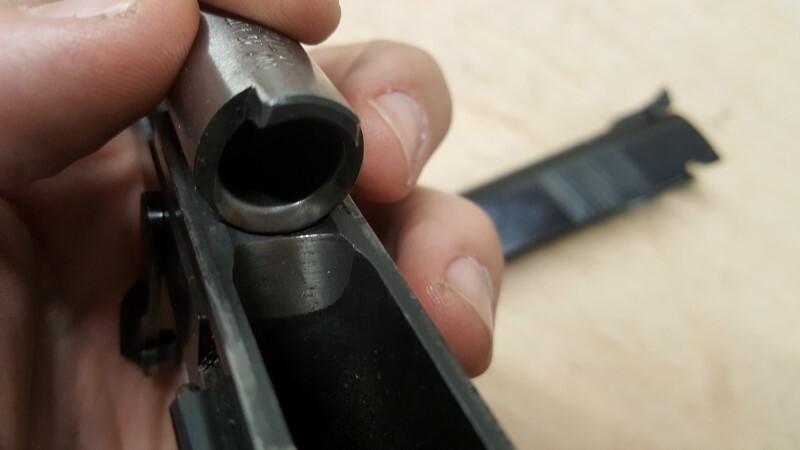 My Colt barrels have a pretty generous leade, so the OAL is only hindered by whether or not they can fit in the magazine without rubbing on the front inside edge. Or your ramp angle is incorrect? If swapping mags doesn't help install a higher mag catch. Egw makes them.. fixed several feed issues with those. Do an Google search for "1911 bullet nosediving"
The HP and JHP's are good accurate bullets. Their down side is that the nose necessarily has an edge that's tailor made to catch on things. 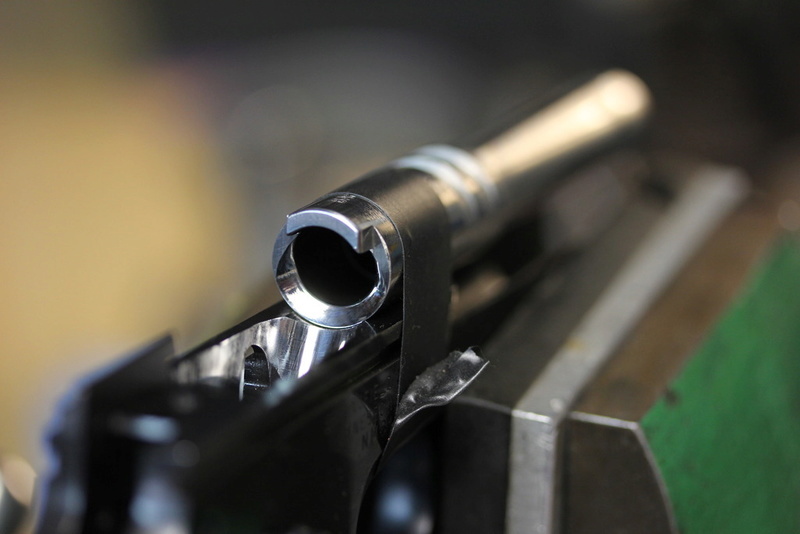 They sometimes require a really carefully smoothed and polished barrel ramp/throat. If the suggestions above don't solve your problem, try one of the fine non-HP SWC's, like the Magnus 801, etc. They shoot very well also. When you push barrel back all the way into full recoil the barrel should be resting on the frame. Does the ramp on the barrel protrude out past the frame feedramp? Is it flush? It's supposed to be about 0.03" short of flush. I reload that exact same bullet (Magnus 185 LHPSWC) at 1.245 and it cycles & shoots all 5 of my handguns. Maybe reload a tad longer as stated above. Wow, such an awesome response! I'll check everything tonight when I get home. This is the first FTF I've had on this pistol, which is new to me. I had no issues with Federal Match 185 or Winchester Service Grade SWC 185, but this is the first round with a longer nose that I've tried. Jon, do I just need to lock the slide back to take that measurement, or do I need to hold the slide as far back as possible? Any other barrel manipulation? 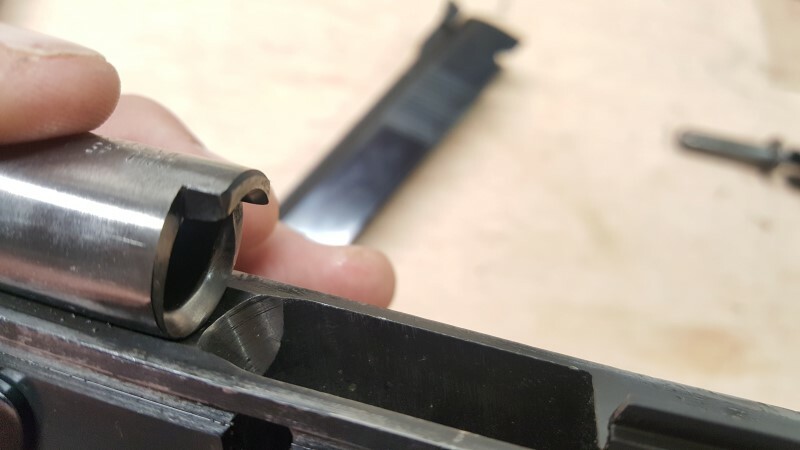 Ideally the easiest way to check is remove slide and take the barrel and put it in the frame. Insert slidstop pin. Push barrel down and to the rear. Then you can see cleary with no obstruction what the relationship between the frame feedramp and the barrel ramp are. Jon, I would increase the COL, seating the bullet out farther. The bullet nose will contact slightly higher up on the ramp which reduces the angle of impact. It has worked for me. oldsalt444 wrote: Jon, I would increase the COL, seating the bullet out farther. The bullet nose will contact slightly higher up on the ramp which reduces the angle of impact. It has worked for me. I received a PM from someone with similar issues suggesting I try a longer OAL (in addition to the multiple suggestions here). I figure I'll give that a shot. Can't hurt, as I've got about 900 Zero 185's to use. Interesting to read up on the nose-diving. Found a good article that explained the situation, but offered no solution, though comments suggested new magazines or mag tuning (lighter springs, reforming lips). It's hard to tell but to my eye, the frame's feed ramp is not correct to feed much other than hardball. I looks too shallow/short. If that is the case and you have it re-cut, it looks like you will need to refit a new barrel too (to get the proper setback). I'm sure Jon will chime in on this soon. ...."no gunsmith" but you know all the proper technical terms. The barrel set back is ideal. The feed ramp could use some polishing. If you load only 1 cartridge will it load it from magazine? 1911 was designed for bullet to strike frame feed ramp then slide/bounce up over barrel feed ramp/throat into barrel (hitting top of chamber). Yes they can load smoother than that, but that was how it was designed. So the set back allows a bullet tip or jhp to hit frame feed ramp then miss the barrel ramp until partially chambered.....then smoothly chamber (goes over small radius at throat/ramp juncture). If set too close to the frames feed ramp they will jam on it because the barrel digs into the bullet nose. It does need a cleaning. Been shooting softball loads with Accurate No. 5. Kinda dirty. And yes, the frame ramp could use a polish, but I haven't had any issues up to now. At any rate, the previous owner (a friend of mine) didn't reload and shot pretty much Federal Gold Medal 185s exclusively. Those fed 100%, but they're much shorter with the "button" nose. I'm thinking getting the zeros to work is going to require some play with the cartridge OAL. After talking to some folks today, I'm going to also check my mag release point and my extractor fit. Jon, my FTFs happened with 2 or 3 rounds in the mag. No problems racking in the first round with 5 loaded, never FTF on the last round. I'll play with racking single rounds and get back to you. FWIW Federal Gold Medal Match 185 SWC measure 1.165 & very consistent at that dim. Not saying this will fix anything, but I found my FTF occured as the round entered the chamber. Polishing the chamber (with q-tips and MAAS polish by hand) cured that problem, provided the gun (chamber) is kept clean. This was user created problem after changing to lighter recoil springs along with Powder Puff loads. Just about any typical ammo, or a slightly greater powder charge fixed the problem. But I'm pretty stubborn about sticking with my light loads. Gary Wells wrote: FWIW Federal Gold Medal Match 185 SWC measure 1.165 & very consistent at that dim. I'll re-measure, but I'm pretty sure that's how mine measured. Are yours white box or the older ones. I bought a half-case (500 rounds) about 4 or 5 years back. Those were the older box design & not white box. It seems to me that I have seen in print that the white box had some accuracy/precision issues.